I had an unsuccessful surgery for hyperparathyroidism because the surgeon just removed the adenoma from my neck and then transplanted the tumor into my sternum. This is totally out of protocol. I then went to an endocrine surgeon out of state and was told I still had the disease due to high calcium levels and plenty of symptoms. But this surgeon made me undergo a VATS surgery to look for parathyroid gland in my chest which is extremely rare. After this diagnostic surgery, my calcium levels dropped. Three years ago I had 3 parathyroid glands removed. With 50,000 IU of vitamin D once a week my PTH levels are normal and vitamin D is normal but the calcium is high at 11.8. I am on Sensipar 30 mg once a day for my hyperparathyroidism to see if this will lower calcium level. I do not want to have my remaining parathyroid gland removed. I have been on it for 3 weeks and no side effects. I had 24 hour test done and calcium levels rechecked and hoping my calcium level will be down when I see the doctor on 3/26/15. I recently had hyperparathyroidism and had one gland removed which was low in my chest. Within 2 weeks the scar was virtually non-existent. I was told you should never take vitamin D and calcium if you have parathyroid disease. You should cure the disease first otherwise you are at risk of a stroke. The body does not require large amounts of vitamin D and 10 minutes in the sun daily is sufficient and natural. Be careful with vitamin D.
I have/had hyperparathyroidism disease, had blood work done, high calcium levels, and very high PTH levels. I had surgery for tumor (size of pecan) on lower left nodule. I am now so hot internally and now I am not, my bones hurt and now they do not, need to lose weight all in upper trunk area/breast - grew 4 sizes in one year. So far no additional medicine and I need to lose 50 lb. I had a good surgeon, neat incision and looking toward a good prognosis. My mother is 90. She had the symptoms many years ago and did the surgery for the removal of the glands. The doctor couldn't find the gland. 20 years later, only 3 years ago she again went through the surgery with the surgeon insisting that he could find the gland, but no gland is found again. Now she is in a nursing home with swollen fingers on the right hand, so she can't eat or write or turn the pages of a newspaper or magazine with that hand. She can no longer stand because of weakness in her legs. Please get treatment early so this doesn't happen to you. I have two nails on one hand that started turning reddish purple at the nail bed/cuticle. Then my little finger had a hole and I can't tell if the nail is going to grow back. It also seems like it is trying to get infected with a small spot of red just past the cuticle. My thumb is not near as bad. I have not injured it I do not use manicures, and do not bite my nails. I simply do not know what happened. I cannot see a dermatologist until the end of January. This started a month ago. I have been putting an ointment on it. I was found to have 4.5 percentage after my hemoglobin test. I had the thyroid removed in 2000 and am on medications now. My blood work shows high calcium. I did a second test and now they say another test in a month. I am a 68-year-old woman and was diagnosed with hyperparathyroidism a few months ago. Had a contrast test done which showed no tumor on the glands. I had elevated PTH, low vitamin D level, osteoporosis, but normal calcium levels. My symptoms (except for the osteoporosis which, to me, may just be post-menopausal bone loss) were (and to some extent still are) more appropriate to hypo- rather than hyper- parathyroidism: fatigue, leg cramps, brittle nails, patchy hair loss (including thinning eyebrows). My doctor has me on prescription-strength vitamin D plus 2000 units a day. This has brought my PTH level down to the normal range and has stopped my hair loss (which he says was not caused by the hyperparathyroidism but which I say was) but all other symptoms remain. I also have moderate kidney damage which they at first told me was not bad enough to have caused the hyperparathyroidism but, in the absence of having found a tumor on the gland, they now say was the cause. They have diagnosed me with secondary hyperparathyroidism. But all my symptoms (except for the hair loss) remain despite the reduced PTH and I'm beginning to think that I'd like to have exploratory surgery done on the glands despite the negative x-ray. I have been feeling sick for over six years. I've had all the test doctors could think of. I was told lupus, it's “in my head,” fibromyalgia, and many other things. But with all the tests, nobody thought of checking my parathyroid. 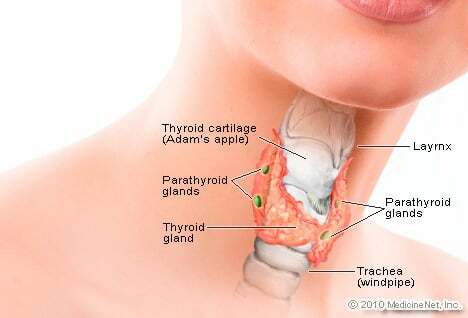 One doctor said my thyroid was fine, but there is a nodule and we should remove the thyroid just in case it is something. I insisted on more tests and this is when (on the second ultrasound) he suggested doing another blood test and checking my calcium and PTH levels, both of which were high. So, I started researching. I wasn't about to let him cut on me. I found a hospital in with a wing totally dedicated to parathyroid disease. I am going there to have it removed, with someone who does this 15 times a day, five days a week. He seems to know what he is doing. My tumor weight was 2,600 mg when removed. I have had vocal cord problems since surgery but am improving. The most interesting thing from surgery is that my blood pressure is normal on one medication, not three or four!! My surgery was two months ago today. I have more energy than I've had in years. Thank God for my successful surgery.